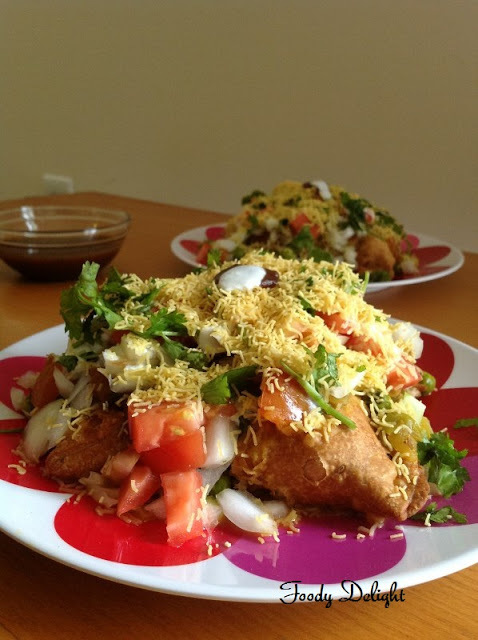 "Samosa" chaat is mouthwatering delicious snack. 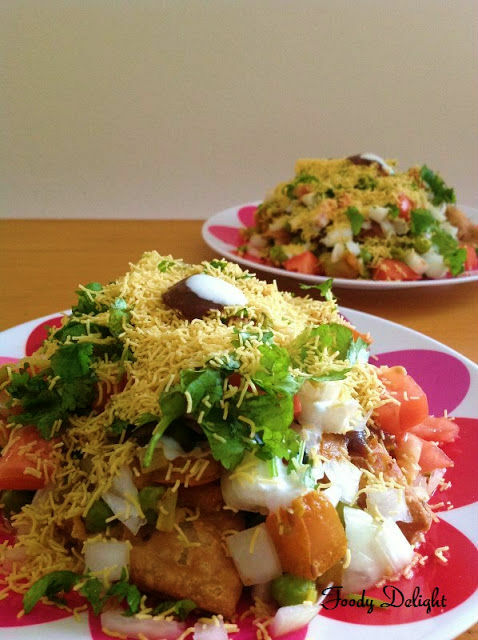 A famous Indian street food made with some leftover scrambled samosa topped with chaat chutneys,yogurt, ragda and sev. 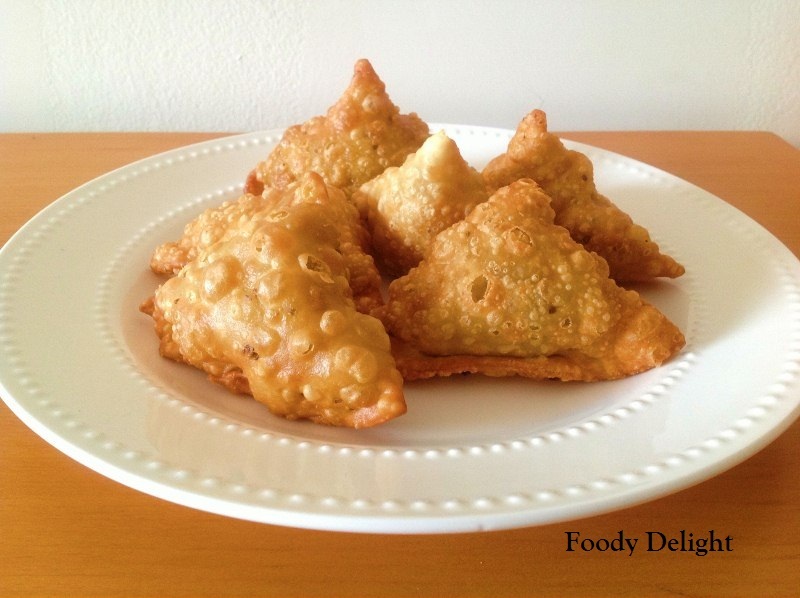 Samosa - 4 nos - "Check the recipe here"
When oil heats up, add cumin seeds, asafoetida . Then add green chilly and ginger and garlic paste . Fry till raw smell goes off from the paste. Add chopped onion . Fry till onion turns light golden in colour . Add tomato puree , red chilly powder and tumeric powder . Cook till you see oil separates from the gravy. Then add boiled chana , chana masala and salt . Mix well . Cover and cook for 5 minutes. When done, turn off the flame and add lemon juice and mix well . Lastly garnish the chana masala gravy with chopped cilantro. Keep 2 samosas into each serving plate. Break each samosa into 3 pieces. Over the samosa pieces, add spoonful of chana masala gravy. Add chopped onion and chopped tomato. Then add green chutney and dates and tamarind chutney. Drizzle little yogurt and sprinkle pinch of red chilly powder. Garnish with chopped cilantro and fine sev. 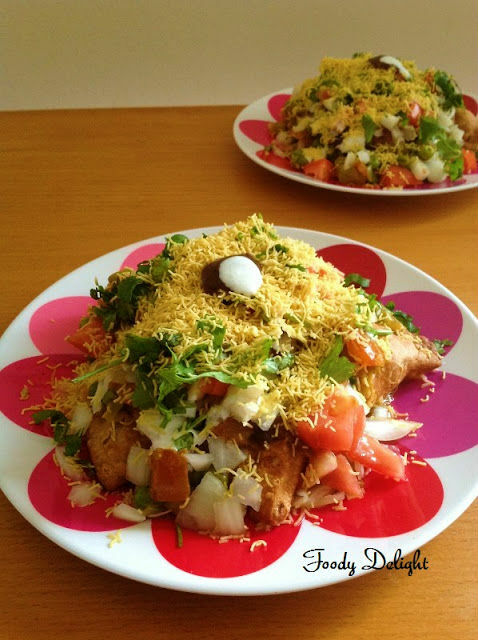 Lovely chaat I can enjoy any time..nice recipe and lovely presentation dear..
wow.. so delicious.. makes me hungry..
looks really yummy.. mouthwatering.. lovely pics!! i can have that plate right now. I am a big fan of chat items! Samosa chat looks delicious!